After 107 years of promoting to evolution of the automobile through motor racing, the Milwaukee State Fair property will end their streak of providing at least one auto race a year (excluding years of world war) to the residents of Wisconsin in 2010. Until the approaching racing season, the Milwaukee Mile had been credited for being the oldest running speedway in the world. Last week, NASCAR was forced to provide the unfortunate news that neither the Nationwide or Camping World Truck series racers will return for their annual visit to the Milwaukee Mile. Their announcement follows suit of the IndyCar series will had kept the race off the 2010 Izod IndyCar schedule. With racing at the Milwaukee Mile appearing to be stalled for 2010 by a contentious battle amongst private and government assemblies as well as a major debtload, the latest attempt for local businessmen Frank and Dominic Giuffre to take over promotion of the racetrack fell apart in mid November. Significant to open-wheel racing history (most recently the IndyCar series), an event at the one-mile oval were traditionally run on the week following the Indianapolis 500 for many years since first done in 1947. 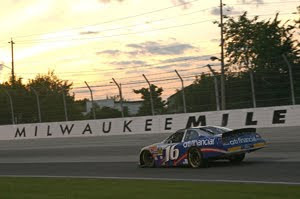 From 2004 to 2006, the Milwaukee Mile also scheduled two event in the year for opwn wheel with IRL IndyCars and the Champ car events. Through multiple events, the Milwaukee Mile played host to some historic moments. In 1963, the track was the scene of Indy car racing's first triumph by an rear-engined race car as Jim Clark drove a Lotus-Ford to victory lane. Among other popular occurrences included the Andretti family of drivers Michael, Mario, and John taking 1-2-3 in the 1991 race. One more moment the one-mile track provided was the scene of the late Greg Moore's first CART series victory holding off Michael Andretti to win the 225 mile event. Running two races in the 1980s, the NASCAR Nationwide (then Busch Series) possessed a lasting presence in the area from 1993 to 2009. Drivers like Dale Earnhardt Jr, Greg Biffle and Carl Edwards won races on the storied surface. The NASCAR Camping World Truck also held a race at the Milwaukee Mile since the tour was started in 1995. 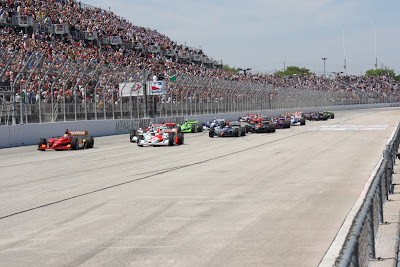 Despite the lack of a future suitor, hope surrounds the possibility of major auto racing returning to the Milwaukee Mile in 2011.